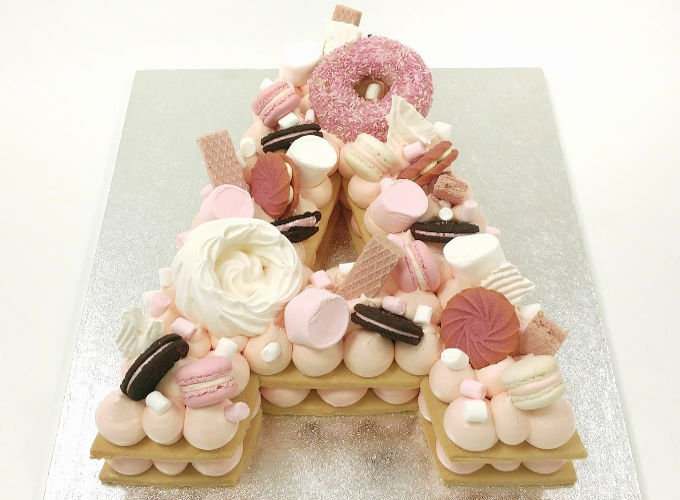 Cream tarts are the latest indulgent cake craze to hit the cake scene and boy do we love a lavish cake craze in the Cakes by Robin cake parlour. Just like fashion, cake design has its seasonal trends. You just wouldn’t believe how exciting and innovative it is in the world of cakes! Other recent cake crazes we’ve loved are Ombre cakes, Rainbow cakes, Geode cakes and Unicorn cakes. At Cakes by Robin, new delicious challenges are what keep our excitable cake creators going and the cream tart is the latest cake craze we are fully embracing. These gorgeous cakes in the shape of numbers and alphabet letters are as good looking as they are a scrumptious delight to eat. Thanks to Adi Klinghofer for bringing this craze into being. We are truly grateful. While we love to come up with our own ideas and creations, we love a cake craze too and we’ll make, bake and decorate whatever our customers desire. So, what is all the cream tart fuss about? First of all, let me describe to you exactly what it is (and what it isn’t). We’ve had heated discussions in the cake parlour, and we can only describe the cream tart as a cross between a cake, a biscuit and a fruit tart. It’s not a French pastry slice, but it looks a bit like one. The cream tart sandwiches cookie-type layers with a cream filling and more cream and a beautiful arrangement of sweet-treats on top. The finishing touches include berries, flowers (yes real ones), meringue kisses and macarons. In all honesty, you can put exactly what you like on top, and the cream filling can take a number of forms from mascarpone and whipping cream to crème pâtissière. Strangely, the French pastry-style dough layers aren’t quite cake, aren’t quite pastry and they aren’t quite biscuits either. They are though incredibly satisfying, with an outer crunch and a soft texture inside. To say we are slightly addicted is an understatement. The cream tart is a truly mouth-watering dessert and oh so pretty. With our secret dough recipe, and our passion for extravagant decoration, we have taken to the cream tart craze like ducks to water. The cream tart makes a refreshing change to a traditional birthday cake, so if you are looking for something a little bit different for your next loved one’s special day, call us at the cake parlour to discuss your requirements. Whatever your cake passion, we can bake a special cake just for you. If you are still hooked on ombre cakes (cakes with graduating coloured frosting), rainbow cakes (colourful sponge layers creating an awesome surprise on the inside), Geode cakes (amethyst inspired cakes with an edible crystal-like carved indentation) or unicorn cakes (self-explanatory and oh so very cute), we can make the perfect cake for any celebration.